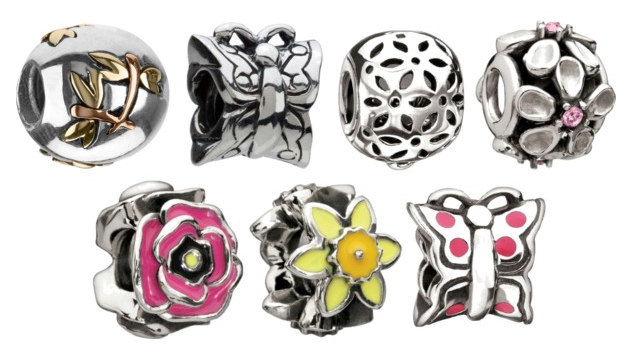 New Chamilia Beads for Spring! Say Hello to Spring with Chamilia! Pastel colors, butterflies, and flowers! Chamilia has a huge collection of pastel beads that are popping out for Springtime! Perfect to add to your bracelet, or begin a new bracelet for Easter. Even though it’s still pretty chilly here in the midlands, these pieces are sure to make you smile! The beads come in sterling silver, gold, murano glass, crystal and enamel. These make the perfect gift for someone or for yourself. Which color and style is your favorite? Easter Gift – Surprise her with a gift of Chamilia! Bridesmaid Gifts – Give them a bead and a bracelet and it will start off their own collection. Mother’s Day Gift – She will adore a bead to add to her bracelet, or you could begin a bracelet for her! Your mom will love it! Birthday Gift – Who wouldn’t love a gift of Chamilia? She will remember the day that she got the beads from you and will cherish them for a lifetime! Just Because – Give her a bead to add to her collection, just because you adore her. We also have the Chamilia Disney Collection… Remember your childhood with these adorable pieces by Disney. See our New Chamilia collection online here. This entry was posted in Jewelry, Jewelry News, Jewelry Trends and tagged bead, beads, bracelets, chamilia, chamilia for spring, Jewelry. Bookmark the permalink.